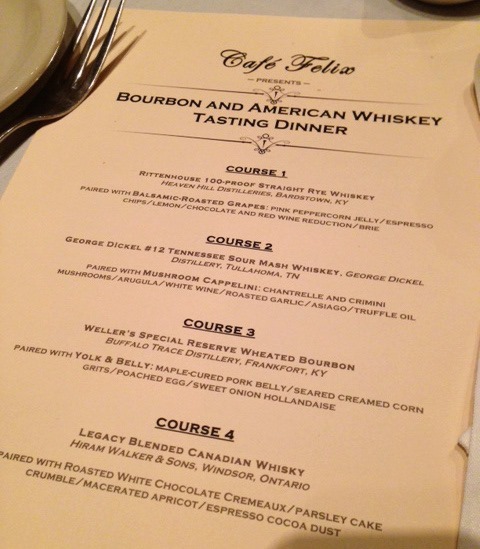 You may remember that last month I attended Café Felix’s “Origins of Whisk(e)y Tasting Dinner.” This was the first whiskey tasting dinner hosted by Café Felix, and they have since begun offering the tastings on a monthly basis. 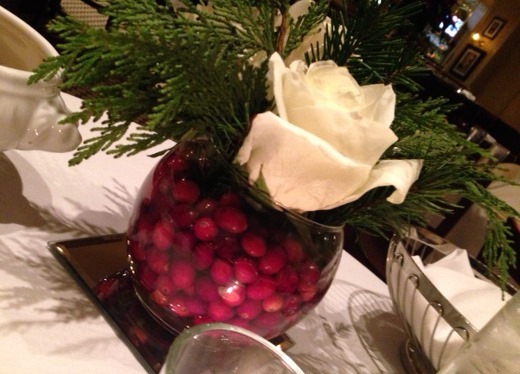 Loved the fresh seasonal décor again this month. 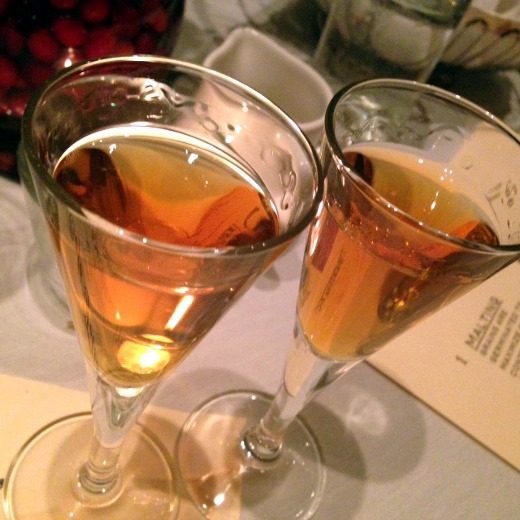 The first course featured my favorite whiskey of the evening: Rittenhouse 100-proof Straight Rye Whiskey. I do love spicy rye whiskey. 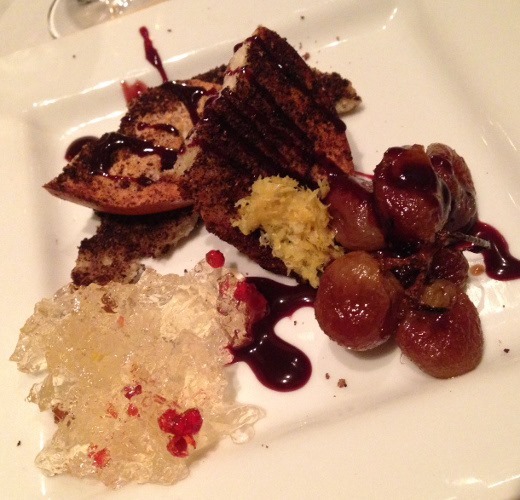 The food pairing was unique without question: balsamic-roasted grapes, pink peppercorn jelly (which brought back memories of the cucumber soup with pink peppercorns that I had in Dresden, Germany last summer! ), espresso chips, lemon zest, with a chocolate with red wine reduction. Shortly after this plate arrived we were all also served a small wedge of brie to accompany the dish as well. I’m not sure I loved the combination of these flavors, but it was, well, a unique experience, despite being a bit difficult to eat. 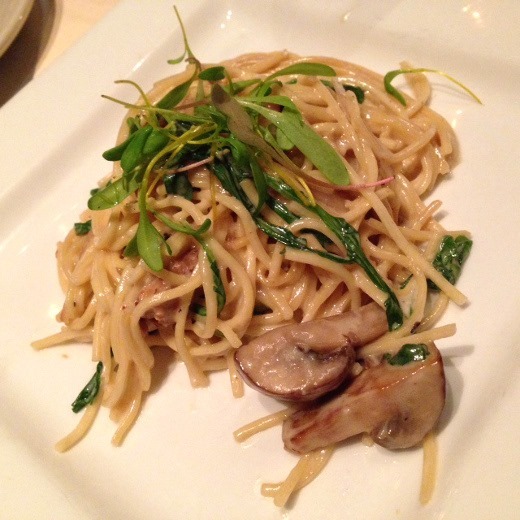 The second course featured my favorite food item, Mushroom Cappelini, consisting of fine pasta in a rich, earthy cream sauce. This course was paired with a Tennessee Sour Mash Whiskey. 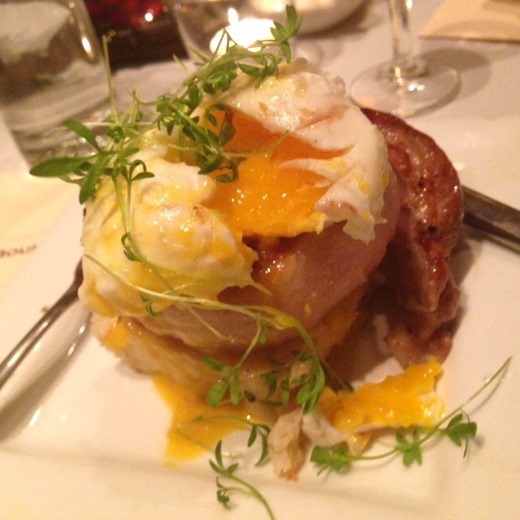 The third course seemed to be the crowd’s favorite dish, as many people could be heard raving about it – who doesn’t love pork belly? 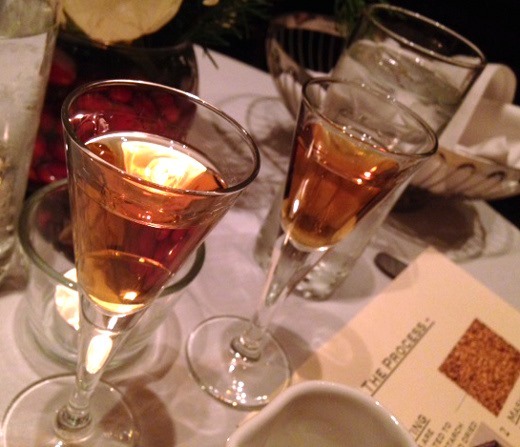 First up, we received our tasting of a wheated bourbon to accompany the dish. 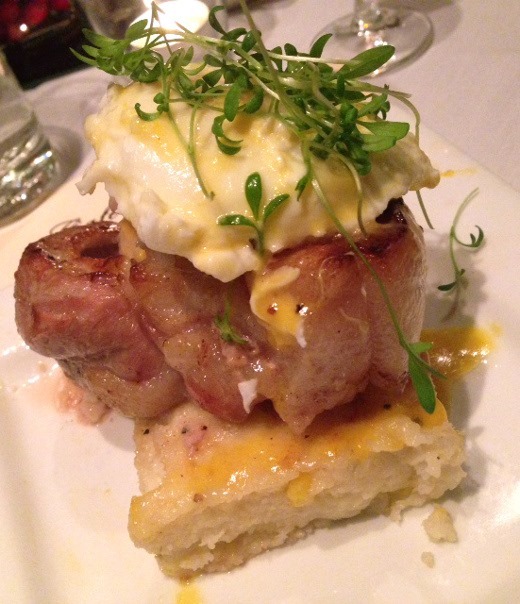 And, after a bit of a wait from the kitchen, we received our third course: maple-cured pork belly atop seared creamed corn grits, poached egg, drizzled in a sweet onion hollandaise. I can imagine why this dish took extra time: poaching 40-50 eggs and having them all ready at the same time must be a great challenge. So kudos to the kitchen for that. The meaty parts of the pork belly I liked, but once I reached some of the fattier portions, I passed the meat off to my dining companion and enjoyed the eggs and grits on their own. 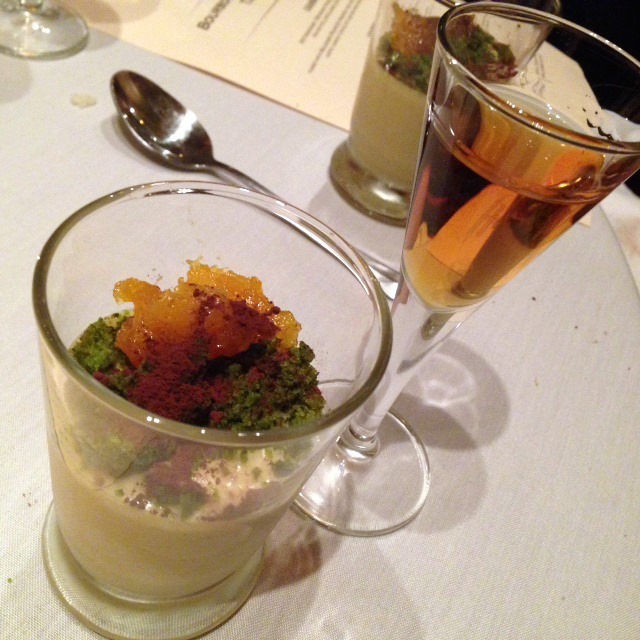 The dessert course was paired with a blended, smooth Canadian Whisky. Dessert was good, but honestly it didn’t make a whole heck of a lot of sense to me. We were served a roasted white chocolate creameaux (a creamy, smooth pudding-type dish), which was topped with a bright green, grassy parsley cake crumble, macerated apricot (just a bit too chewy for me), dusted in espresso powder. It was fine and good, but I just didn’t see the need to pair the flavor of parsley with white chocolate and whisky. I would have liked to have heard from the chef more frequently at this tasting, to understand the rationale of the pairings, but I understand that he must have been quite busy in the kitchen. Aaand, there was a bonus round! 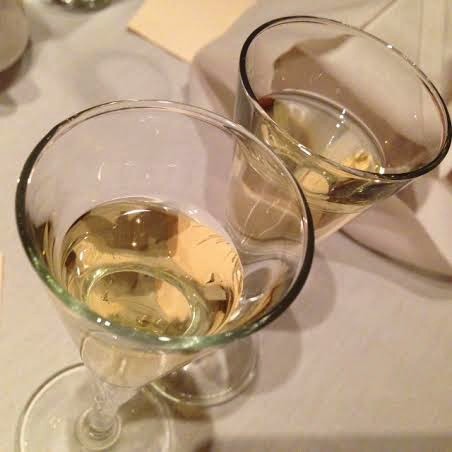 Not a whiskey, but a sampling of a French sémillon wine. Nice, nice. All in all, I really enjoyed the tasting experience. 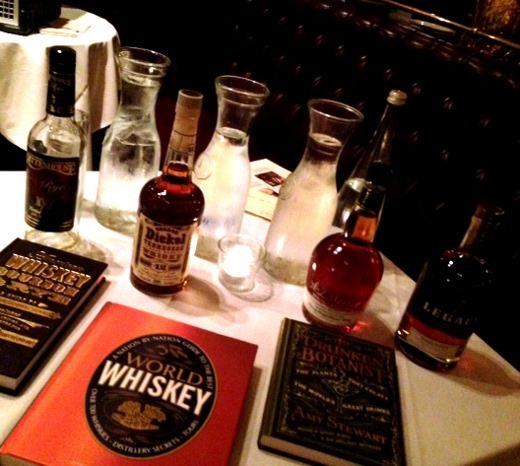 I was a fan of the whiskeys that were featured at this tasting, especially the rye whiskey and the bourbon. The food, I thought, was lackluster compared to the first tasting. Last time, I was blown away by the incredible food. Our host, bartender Jude, informed us all that a different chef created and prepared the food pairings for this tasting. While I appreciate the ambitious menu and adventurous ingredients, in my humble opinion, I think the chef went just a bit too far out there for me this time. While the previous tasting’s food menu was perhaps a bit less adventurous, the dishes were sophisticated and executed extremely well. I will say the food portions were a bit more generous this time though, which we also appreciated. 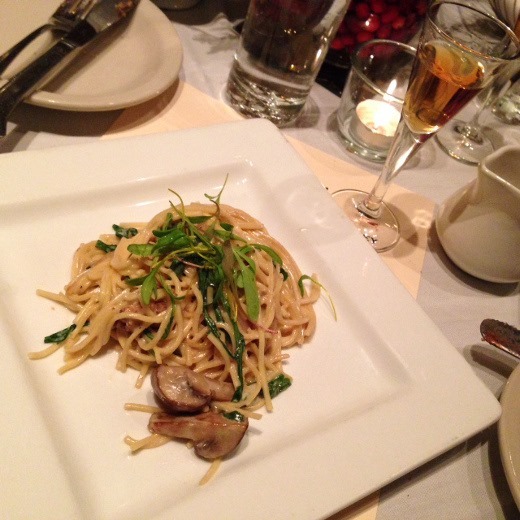 These tastings at Café Felix are a fun time and offered at an affordable price. Check ‘em out.